June 7 – In late December 1964 a massive rain system rolled off the ocean into Oregon and northern California and continued to drop rain for 20 days. 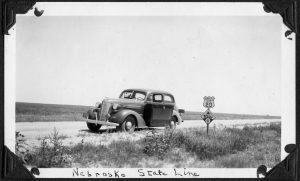 When it was done the floods had killed nearly 20 people, severely damaged or completely laid waste to at least 10 coastal towns, destroyed all or portions of more than 25 major highway bridges, filled two ocean ports with debris so that they needed to be closed, and knocked out the region’s only railroad. Phone and electrical service was cut off, and for months the only way in or out of the region was by boat or helicopter. 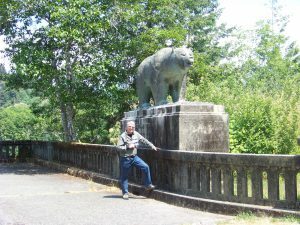 Earl and Ethel’s album includes a photo of a bridge with two bears. 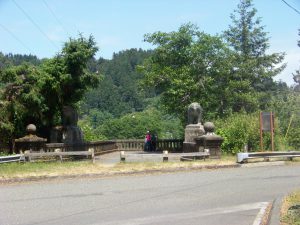 Across the top was written the description, “Decorative Bridge – Cal.” Their photo also contained a highway sign indicating that the bridge crossed the Klamath River and was part of US 101. 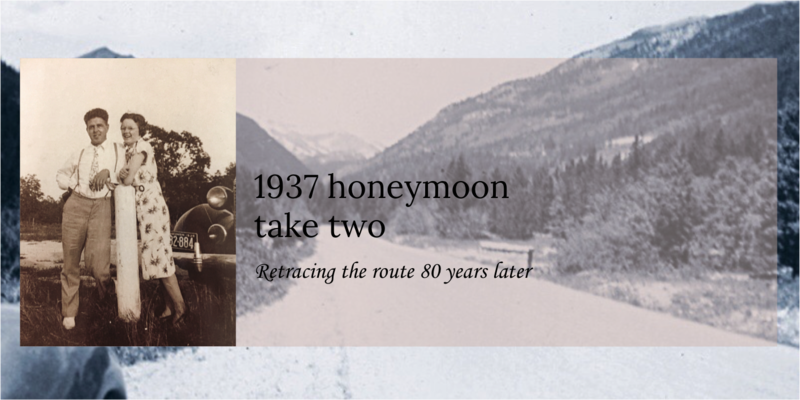 This detail showed just how far north the couple traveled in California, the highway they used and the route they would follow to cross into Oregon. 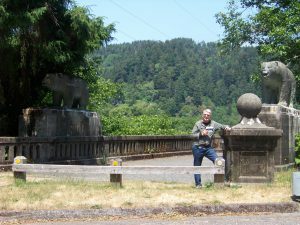 Further investigation revealed that the bridge was completed in 1926 and named the Douglas Memorial Bridge to honor a former state assemblyman for that district. 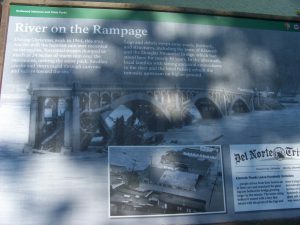 The bridge was destroyed in the 1964 floods on December 22. 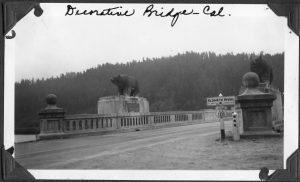 All that remains today are a single west section of the bridge and the two 8-ton concrete bears Earl and Ethel captured in 1937. A replacement bridge for US 101 was later built further upstream. 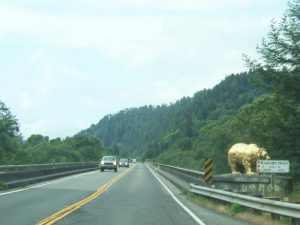 Its entrance spans on both ends have similar sized bears painted gold. 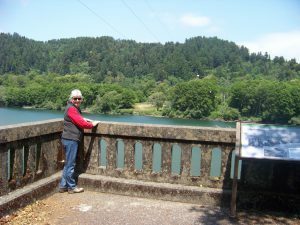 Lynn overlooking a peaceful Klamath River today from the former bridge. A replacement tribute to earlier glory.